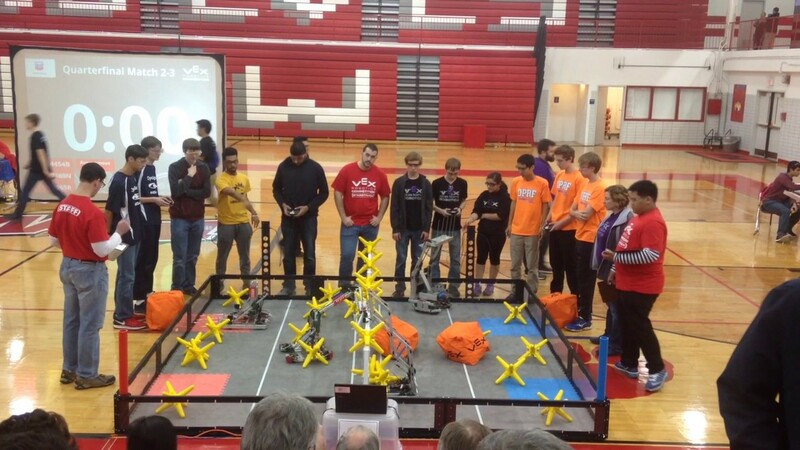 The Niles West VEX Robotics team hard at work during a competition. With robot wheels spinning in high gear, the VEX Robotics season is approaching its eventful end. With state, national, and world competitions coming up, the qualifying teams are getting prepared to send their robots off to a competitive sendoff against other top teams in the state and nation. Team 321J, whose members are freshmen Casey Meskovich and Mike Schuller, qualified for state at last weekend’s Carbondale competition by making it to tenth place in the quarterfinals despite three high ranking Kentucky teams. “We’re working on our autonomous code right now, and we’re trying to make it so that it can score six points at the beginning of the match which is a large advantage when we’re up against teams,” Schuller said. 321H, Havoc, is another team which qualified for state. Steamrolling through the competition early in the season, junior Thomas Nguyen and his team are excited for what’s to come. Those who have finished up their season, including the seniors who have already had their last robotics competitions, look back fondly on the season. All the individual robotics teams worked hard, and they enjoyed learning and growing with the team. “My team, although it isn’t going to state, still performed quite well. We supported each other as team members. My role was the programmer, so I was handling the basic functionality of the robot at all times. Each member had a role, but it was together that we competed,” senior Muhammad Afzal said. With many robots now out of commission, the team is looking forward to next year. With high hopes and commitment, the team hopes to do better next year and recruit new interest. If you’re interested in joining VEX robotics, come to room 1520 on Wednesdays or Fridays to ask for more information for next year.